- Sari Colt on 三月 19, 2016. 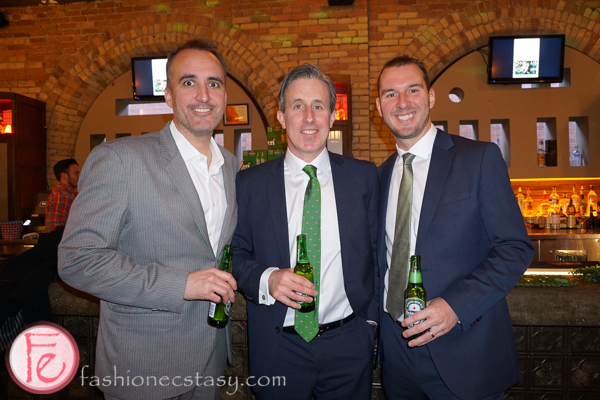 Lucky Ball 2016 was held at the Revival Bar two days ago to raise funds for the Fort York Food Bank (FYFB) and to celebrate the spirit of St.Patrick’s Day. This year marks the fourth year of the annual fundraising event. Fort York Food Bank is affiliated with both the Daily Bread Food Bank and Second Harvest, servicing 1,200 people in the downtown west community each month. FYFB provides an integrated set of services to help the community in a holistic manner including a food program with a three-day supply of groceries that is consistent with the Canada Food Guide; a drop in centre with healthy meals, computers, clothing, reading materials; workshops and support to help with challenges its clients are facing; volunteering, community garden and special events. All of them are essential to help people survive. The event originally started when Scott Shallow of Brad Lamb Realty and Sennheiser provided a $10,000 donation to Fort York Food Bank. From there the plans began to create an annual St. Patrick’s Day fundraiser to help FYFB on a regular basis. The first year of the Lucky Ball raised almost $30,000 and this year’s Lucky Ball raised close to $50,000.00, with 100% of the proceeds going directly to the foundation. Lucky Ball committee members Scott Shallow, Trevor Guy and Chris Murphy are all on the FYFB board, with Chris Murphy acting as President of the FYFB board of directors. Guests of this year’s event were treated to an open bar serving Heineken beer, Pravda Vodka drinks, and delicious appetizers including coconut shrimp, spanakopita, vegetable skewers, vegetable spring rolls, brie cheese with roasted red peppers and olives and mini samosas. Chicken & Waffles, Toronto’s own R&B and Soul music band played a set of funk and soul songs that got everyone dancing. There was a silent auction area with interesting items available to bid on such as the Montreal Canadiens chair from the Montreal Forum autographed by Guy Lafleur, Leafs tickets, a Price jersey, courtside seats for the Toronto Raptors, a trumpet, and so on. Among the guests attending were Trinity-Spadina MPP Han Dong and Realtor Brad Lamb whose agency was the lead sponsor of the event. Each guest left with a swag bag of goodies including a pair of funky socks and a fifty-dollar gift card from Gotstyle, the latest fashion magazines for men and women, Brita’s water bottle filter, Burt’s Bees’ beeswax lip balm, and a $10.00 Beck taxi ride voucher to get home safely. The Fort York Food Bank generates over 1.5 million dollars of value a year for the charity and is recognized by the Charity Intelligence Canada since 2009. We look forward to helping the great cause again at next year’s Lucky Ball 2o17!